Anonymous sale, Mak van Waay, Amsterdam, 25 April 1966, lot 35. The artist's handlist (Liber Veritatis), 1929-1941, f. 43ro. X. Tricot, James Ensor, Catalogue raisonné of the paintings, vol. II, 1902-1941, Antwerp, 1992, no. 777 (illustrated p. 657). curiosités, where he was surrounded by fantastical glittery objects, seashells, fans, collections of silk and pieces of Chinese ceramics, a constant source of inspiration. 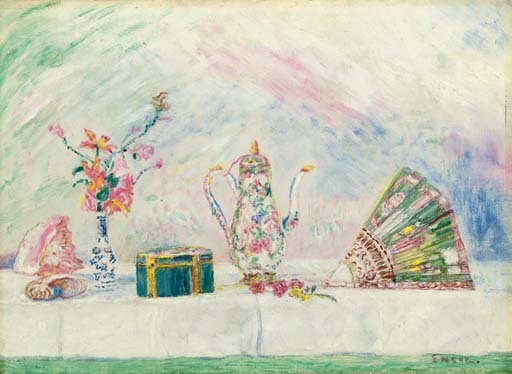 In the present work Porcelaines et éventail, Ensor lays out various objects, taken from his studio, side by side on a white tablecloth, an arrangement, in iridescent pinks and reds, of a large porcelain coffee pot flanked by an elegant Japanese fan and a small pretty vase of flowers. This composition underlines Ensor'’s life-long fascination with Oriental objets d'’art, an interest he shared with some of the Impressionist and Nabi artists. Ensor employs a light palette in this technically refined painting to create a shiny, sparkling jewel, an irreverent, enchanting vanitas. This work remained in the collection of Augusta Boogaerts, daughter of an Ostend hotelier, who met Ensor in the late 1880s and would remain his faithful companion up to his death, although they would never marry. La Sirène, as Ensor called her, assisted the artist in selecting and assembling the elements of his still-lifes particularly towards the end of his life. It is highly likely that she composed the present work, and the fact that it entered her own collection either as a gift from the artist during his lifetime or following his death is a testament to the emotional attachment she formed to this charming nature morte.